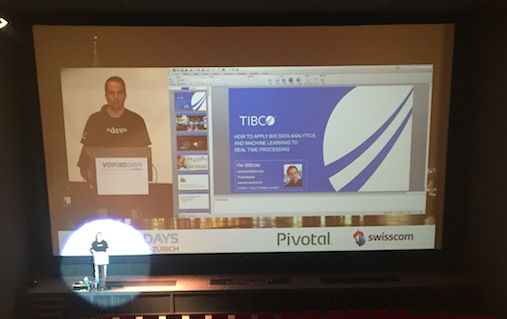 In March 2016, I had a talk at Voxxed Zurich about “How to Apply Machine Learning and Big Data Analytics to Real Time Processing”. “Big Data” is currently a big hype. Large amounts of historical data are stored in Hadoop or other platforms. Business Intelligence tools and statistical computing are used to draw new knowledge and to find patterns from this data, for example for promotions, cross-selling or fraud detection. The key challenge is how these findings can be integrated from historical data into new transactions in real time to make customers happy, increase revenue or prevent fraud. “Fast Data” via stream processing is the solution to embed patterns – which were obtained from analyzing historical data – into future transactions in real-time. The following slide deck uses several real world success stories to explain the concepts behind stream processing and its relation to Apache Hadoop and other big data platforms. I discuss how patterns and statistical models of R, Apache Spark MLlib, H20, and other technologies can be integrated into real-time processing using open source stream processing frameworks (such as Apache Storm, Spark Streaming or Flink) or products (such as IBM InfoSphere Streams or TIBCO StreamBase). A live demo showed the complete development lifecycle combining analytics with TIBCO Spotfire, machine learning via R and stream processing via TIBCO StreamBase and TIBCO Live Datamart. This entry was posted	on Thursday, March 3rd, 2016 at 17:51	and is filed under Analytics, Big Data, Business Intelligence, Hadoop, In Memory, NoSQL. You can follow any responses to this entry through the RSS 2.0 feed. You can leave a response, or trackback from your own site. Powered by WordPress v 5.1.1. Page in 0.186 seconds.